May 01, 2016 10:05 IST by Eliza Lobo	in Celebrity Owned Cars. Jaguar Land Rover has been in a resurgent mode in the past year or so. With a slew of launches making their way over to Indian shores, buyers and fans have been lapping up everything that the acclaimed British brand has had to offer so far. The Range Rover has been known to attract the world’s automotive cognoscenti who appreciate the finer wheels in life. From the hospitality and realty sector to ferrying around the Czars & Czarinas of the domestic film industry, Range Rover has been at the service of the elite. 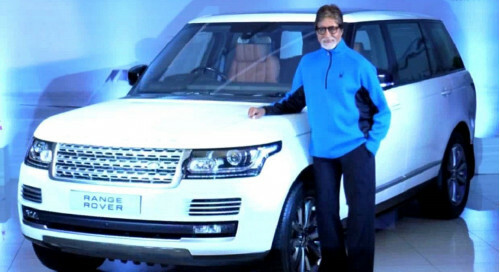 Bollywood stars in particular have taken a particular shine to Jaguar Land Rover’s products, but when a veteran superstar like Mr. Amitabh Bachchan decides to treat himself to one of their models, it is no surprise to see him select only the best of the lot. The superstar who shows no signs of slowing down, appears to be determined to enjoy his seventies in supreme luxury and style. This is the reason why, he seems to have made the right choice by opting for the Range Rover. The great part is that Mr. Bachchan didn’t just get any Range Rover, but splurged on the top of the line, Autobiography edition in Long Wheel Base guise. The Range Rover is a highly customized version, where each aspect that has been tweaked, has been only after the explicit approval of the veteran actor. Thus, right from the trim options used in the dashboard to the grade and colour of the leather used in the cabin, every aspect of the luxury has the stamp of the Bollywood superstar. The showroom in the western suburbs was chosen for the delivery honours. Respecting the actors wishes for privacy, the company refused to share the exact cost of the customization and the exact options used in the car. One thing that has been confirmed though is the power plant. The 4.4 litre engine churns out over 335 bhp and goes screaming all the way to a 6000 rpm red line. More importantly though, the car sports a stump-pulling torque figure of 750 Nm! Enough to make any true-blue automobile enthusiast go green with envy over Mr. Amitabh Bachchan’s acclaimed car collection! Mr. Bachchan will grace the big screen once again, in the Ribhu Dasgupta thriller TE3N that’s all set to release sometime towards the middle of June this year. Nissan Intelligent Mobility Tour: Its electric!